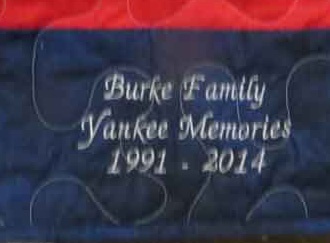 This quilt label was added to the backside of several quilts we made for this family. This type of label with last generations and tells so much about the love they had. 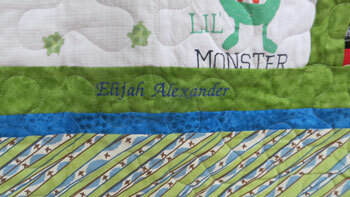 This special quilt belongs to Elijah and is made up of his baby and toddler clothes. 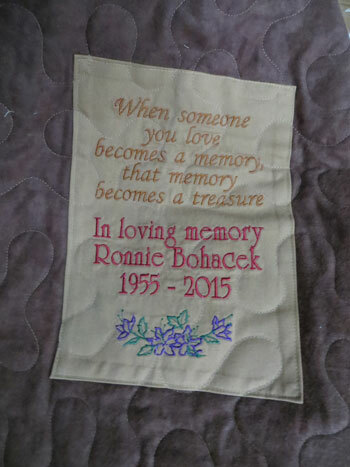 We create a lot of Memory quilts from clothing of people who have passed on. In this case we needed to create a quilt block. 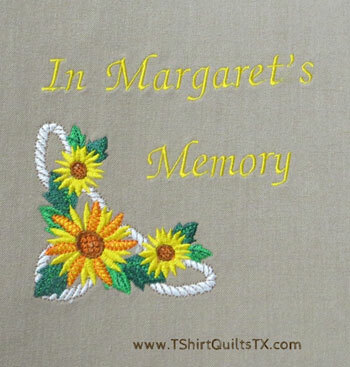 Margaret had a special love for sunflowers and we were asked to incorporate the flower when we created the embroidery. Sentiments or simple statements can express so much. This label was attached to a baby quilt that was made with shirts from his Papaw. While this child never got to meet him, he will always have a piece of him he can carry around and treasure. 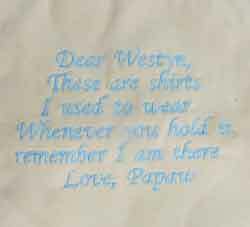 Whether it is a birthday or anniversary celebration, machine embroidery will create a lasting sentiment. This embroidery was done on the lower border of the quilt. The quilt was a wonderful collection Yankees Baseball shirts. The sentiment summed years of family memories nicely! If you would like customized embroidery in your quilts, please complete the 'Embroidery' section of the Order Form. You can also call us to discuss details and options.